Upright vacuum cleaners are the best overall for carpet vacuuming and are still the most popular design. They can clean a wider swath of carpet per pass, and are easier to store than canister vacuum cleaners. However, their motors tend to be noisy. Canister Vacuums work better on bare floors, upholstery and under furniture. They're easier to maneuver, especially on stairs, and only require the powerhead to be moved, not the entire machine.They do take up more storage space, but their motors usually run more quietly. Though bagless vacuums do save on the cost of buying vacuum bags, they tend to make up for that savings in more frequent filter replacement costs. Bagless dirt containers are also difficult to clean and keep hygienic, and when emptied, release more dust and allergens back into the air. Bagless vacuums also lose their dust management capabilities faster than vacuums with bags. Bagged vacuums are better at keeping dirt particles safely encapsulated when they're being thrown away. Filtration in bagged vacuums tend to be better because often the bag itself acts as an additional filter, while the vacuum parts stay cleaner and function more effectively. The vacuum you choose will also reflect the type of cleaning you do. Will you be using your vacuum to clean a large home or a small office, and will you be working on one level or more? Are there lots of children tracking dirt in from outside, or do you have pets? Are allergies or asthma a concern? What type of flooring material will you be primarily cleaning? The best way to find the perfect machine for your unique needs is to talk to vacuum cleaner specialists like those from AAA Sew Vac East. 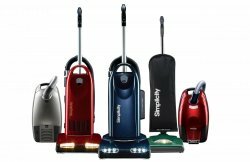 They carry a wide variety of vacuum cleaners and are experts when it comes to specifications and features. With a wide variety of demo machines available, you can test drive several until you find the vacuum that’s right for you. Contact us today.